The name Meadowlark Lemon is synonymous with basketball. For more than two decades, he was known as the “Clown Prince of Basketball” touring with the Harlem Globetrotters basketball team. He averaged more than 350 games a year traveling more than 5 million miles and playing in more than 16,000 lifetime career basketball games. In 2003, Lemon was inducted into the Naismith Memorial Basketball Hall of Fame. His love for the game transcended barriers and brought smiles to generations of fans with his on-court artistry in over 100 countries from Austria to Zimbabwe. He helped change the face of American history, Black history and sports history. These days the 83-year-old ordained minister is sharing his faith and bringing joy through his own comedic basketball team called Meadowlark Lemon’s Harlem All Stars. A feature film of his life is currently in the works and Risen sat down with the legend to talk basketball, joy, and keeping score. 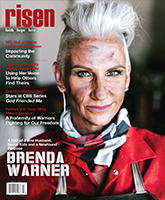 Risen Magazine: At eleven years old you knew you wanted to be a Harlem Globetrotter. How did the love for basketball develop? 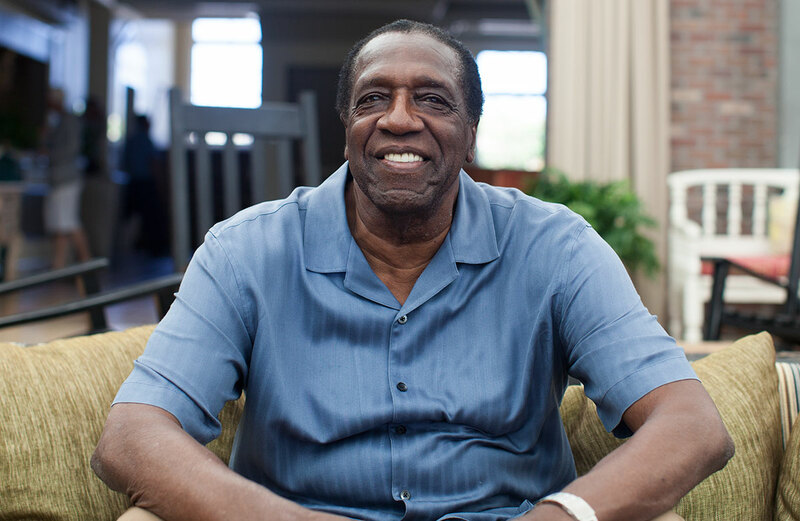 Meadowlark Lemon: I saw a short newsreel at the Ritz Theater about the Harlem Globetrotters and was captivated by the team’s athleticism and comedy. I just had to learn how to play basketball. I ran straight to my dad’s house and rummaged through a cupboard in the kitchen. I found an onion sack so I tore the paper label away from the netting, and cut a hole in the bottom of the sack. Then, I went to an upstairs closet and got a wire coat hanger, which I pulled apart on my way back downstairs. I found a hammer and some nails, and took all of my materials across the street to a big tree. I climbed up that tree, balanced on a limb, and fashioned that onion sack and coat hanger into a net and a rim. I nailed the whole mess to the trunk of the tree, maybe eight or nine feet off the ground and climbed back down. Now I had a basket. That was only half of what I needed to play basketball. I went back to my dad’s house and after several minutes of searching, I found an empty Carnation evaporated milk can in the garbage. It was the closest thing to being round that I could find! I ran back to my homemade hoop and tried to remember how the Globetrotters in that newsreel had held the ball, how they had brought it up to shoot it. At first, I just threw the milk can like a baseball, and about every tenth “shot,” would drop through the net. I shot and I shot that milk can until my dad got home. As soon as I saw him, I raced toward him. “Dad! Dad! I know what I want to be when I grow up! A Harlem Globetrotter! It’s a basketball team! They are great!” I knew in my heart that I would practice and work at it, and that I would give myself to this game until I was good enough to become a Globetrotter. Even though that was a long time ago, I still believe to this day that God planted that dream in my heart as I sat right there in the Ritz Theater. He gave me a relentless desire, determination, energy, and the talent to make my dream come true. I knew all great things come with a price and becoming a Globetrotter would take endurance and sacrifice as I focused on perfecting my game. I was a skinny kid who was not blessed with much strength or impressive height. In order to compete on the basketball court, I had to learn to use skills that would allow me to have an advantage over taller, stronger opponents. RM: You didn’t waste anytime practicing and learning the game, but you could see yourself already at your goal. How do your visions play into your success? ML: Visions have been instrumental throughout my life. I truly believe that I would never have become the success I’ve become were it not for my visions. I’m not saying that I can gaze into a crystal ball and predict the winner of next year’s Super Bowl. However, I am someone who firmly believes that if I can visualize doing something before it actually happens, my chances of achieving that goal are even greater. When I was 11 years old, for example, and I saw the newsreel featuring the Globetrotters, I was witnessing for the first time in my life the great game of basketball. I was also experiencing something else. I actually envisioned myself playing the game with those same players when I became older. Can you believe that? Even though I had never before seen a game of basketball, I could see myself playing with those guys on the screen. That vision was what I consider to be my start on the road to success in basketball. I used this same approach when I played basketball. The records will show that toward the end of my career I made the so-called “impossible shot” [hook-shot] more than 70 percent of the time. Before I took the shot, even while facing away from the net, I would actually visualize the ball leaving my hand and going through the hoop. Years ago, we were playing in southern California. I was standing on the free throw line at the opposite end of the court. I shot the ball and it looked as if the ball stayed up there forever. It hit nothing but net. The promoter met me at half time and said, “Teach me to do that hook shot.” I said to him, “You saw it from the outside. That shot came from the inside out – from my spirit.” That same approach applies to other areas of life. True visions have transformed my time on this earth from mere existence to joyful living. As the saying goes, if you aim at nothing, you are sure to hit it. A worthwhile life begins with a bold vision. RM: Speaking of your patented hook-shot, how did you learn to make them from half-court and beyond? ML: A volunteer coach at the Boys’ Club of Wilmington, who we called Poppa Jack, taught me. Poppa Jack picked me out of all the kids who were playing a pickup basketball game one afternoon at the Boys’ Club and he said, “Meadow Lemon, I have seen you play and you sure seem to love this game…if you continue to play as you are doing, you might do okay. How would you like for me to show you a shot that, if you get it right, could make you unstoppable on the court?” I listened intently, even though I was somewhat skeptical. He truly seemed to believe what he was saying. At this time in my life, I was a skinny kid who was not blessed with much strength or impressive height. In order to compete on the basketball court, I had to learn to use skills that would allow me to have an advantage over taller, stronger opponents. One way to do that was to shoot so nobody could block the shot, no matter what size advantage he might have. The challenge was, how? So Poppa Jack taught me the hook shot and I practiced it every day for three full months. I got to the point where I was making the shot at least 10 percent of the time. Then Poppa Jack did something totally unexpected. He told me to stretch out my left arm. I did. “Now, do the same thing you’ve been doing with your right hand, only use your left.” I did and after another six weeks, I could make this difficult hook shot with either hand. That was the start of the shot that eventually would make me world famous. Here’s an important point; I did not stop practicing after I had perfected the shot. Throughout my entire professional career, I practiced that shot every day. As I grew older and became a member of the Globetrotters, my percentage for making that shot increased to better than 70 percent from half court. I practice that shot to this day as part of my daily workout. I didn’t know at that time, that the hook shot he taught me would become my signature play for decades with the Globetrotters. Michael Jordan is from my hometown and Poppa Jack had the same influence on Michael’s life that he did on mine. RM: So you hone your skills and keep your goal of Globetrotters. How does it work to get on the team, did you need to play at the college level first? ML: After I graduated from high school, I was hanging around Wilmington, waiting for the Globetrotters to discover me. This didn’t make my dad any too happy. He wanted me to go to college so that I could have a chance at a better future and reminded me that I had received several college scholarship offers for football and basketball. One day late in the summer, I was playing basketball with some friends and my dad’s truck pulled up and he motioned me over. He told me, “It’s time for school.” And nodded toward the back of his truck. That’s where I saw my suitcases. In my dad’s shirt pocket was a train ticket to Tallahassee, Florida to Florida Agricultural and Mechanical University (Florida A&M), where I had been offered a dual scholarship to play both football and basketball. I was not too keen on going to Florida A&M. I was frustrated that I simply couldn’t will myself to be a Globetrotter. When I showed up for my first football practice at A&M, the coach told me there had been some mistake with my dual sports scholarship. “We don’t give football-basketball combo scholarships anymore,” he said. “The basketball coach thinks you will get hurt out here.” So that was the sum total of my life as a football player in college. Not exactly Heisman Trophy stuff. RM: Seems like an invitation to try-out, what happened? ML: The story of how I was given a chance to try out for the Harlem Globetrotters still seems like a dream to me, all these years later. When the day of the Globetrotters’ game in Raleigh finally arrived, Coach Corbin loaded me, Poppa Jack, and three of my friends into his car and we headed north. The arena was overflowing with thousands of fans who had come to see the world-famous Harlem Globetrotters. On game day we had a hard time finding Marques Haynes in the lobby because of the surging crowd. I finally spotted him. He said, “You’re Lemon? Yeah, Abe called me and said you’d be comin’. Let’s go.” He took me to the team’s dressing room; the legendary Goose Tatum introduced himself to me. He was putting on uniform Number 36, which eventually became mine. Marques introduced me to others from the team: Rookie Brown, Frank Washington, “Sweetwater” Clifton, and Clarence “Horse Cave” Wilson. I couldn’t believe this was happening to me! My dreams and visions from the past came quickly to my mind. Then, Marques handed me a uniform and told me to get dressed. I had seen the Globetrotters run onto the floor during the newsreel at the Ritz. Now I was running out with them! During team introductions, the announcer said: “Ladies and Gentlemen, Boys and Girls, for the first time in a Globetrotter uniform, from Wilmington, North Carolina, Meadow Lemon!” The arena shook with a sound I had never heard before or since. At halftime, Marques told me that I was going into the game in the third quarter so the Globetrotters could see what I could do. I said to myself, “You’ve got a tryout in front of 15,000 people. Make the most of it.” I played about a quarter-and-a-half and scored 12 points. Everyone was happy with my play. I knew I had made a good impression. I thanked Marques for giving me the chance. I could feel that my dream was about to be fulfilled. RM: Did they sign you on the spot? ML: Based on my performance in the Globetrotters’ game, there was no doubt I had taken a giant step toward achieving my dream. Goose Tatum tried to persuade me that there was not much future in playing basketball and that I should go to college. I knew better. He and Marques were both making $15,000 a year, which was not too bad in the early 1950s. After the game, Marques had told me, “You’ve got the fundamentals and the flash. The comedy will come with time. I’m gonna tell Abe just what you showed today.” He said that if Abe liked his report of my play, I would get called to tryouts in Chicago at the end of the Globetrotters’ season. RM: Needless to say you become a Harlem Globetrotter played in more than 16,000 career games and became a household name. The Globetrotters were definitely influential to the game, so share what their relationship with the NBA was like? ML: The game of basketball is constantly changing. Harlem Globetrotters Founder/Owner, Abe Saperstein, made history and enjoyed a lot of success when he introduced an all-black basketball team during an era when black athletes were held back by the color line. Surprisingly, when I first joined the Globetrotters, the entire NBA had only a handful of black players. He sensed that the country was ready for the Globetrotters’ brand of basketball and entertainment. He showcased some of the best basketball talent in the universe at that time. The NBA took notice and started to draft black players, including Chuck Cooper, Sweetwater Clifton, and Earl Lloyd. Cooper and Sweetwater had been with the Globetrotters. As a result, the Globetrotters started losing some of our best talent to the NBA. Even then, we were still the biggest game in town. Some people say that the Globetrotters kept the NBA in business in its early years. Bob Cousy, who went on to become a legend with the Boston Celtics, once said that the NBA teams would schedule doubleheaders, with the Globetrotters playing against somebody in the first game and then two NBA teams playing in the second game. “The Globetrotters would sell out, but they’d always play the first game,” Cousy said. “When the Globetrotters were through, half the house would get up and leave before the NBA game ever got started. So we knew what our position was.” The NBA owners figured that out pretty fast, and made sure the Globetrotters would play in the nightcap so the fans wouldn’t leave! The Globetrotters were also international stars. In 1974, President Gerald Ford called us “America’s Ambassadors of Goodwill in Short Pants.” That didn’t always give us much motivation, though, because we still traveled in parts of our own country where the white players on our opposing teams would go into the nice hotels and eat in the nice restaurants. We couldn’t. One day, Abe Saperstein saw the pain in my face that this legacy of racism caused me. He said, “Mead, I know what you’re going through. Mead, make ’em laugh.” Those words helped change my life to one of seeking and giving joy. It changed the way I saw my role. I had an opportunity to change the way people saw me. I had the ability to change the way I saw everyone else. It didn’t have to be just about the color of our skin, white, black or any other color of the rainbow. For this reason, my main contribution to the Globetrotters’ legacy was my comedic prowess and basketball artistry. Those who attended Harlem Globetrotter Games came to watch comedy basketball and enjoy unforgettable-shared memories with family and friends. Laughter is healing and everyone left the game feeling more joy than when they arrived. That’s the mission I still see myself doing today using different venues sharing stories that bring back those happy memories. I enjoy the memories as much as the fans. RM: How does faith play into your story? When did you become a Christian? ML: I love sharing the story about meeting the man who changed my life – His name is Jesus Christ. In 1982, a friend of mine told me I needed Jesus Christ in my life. He led me in a simple prayer asking Jesus into my heart. After saying the prayer, I wish I could say my life changed completely in the next instant, but there were no flashing lights and sirens as I would have expected. I was sincere when I prayed. I really did want the Lord’s presence in my life. In the coming weeks and months my faith grew. I realized that God had cleaned me up on the inside and my desires had changed. I wanted to know more about the Lord and His Word and I wanted to learn anything I could about having a closer relationship with the Lord. In less than a year, I began sharing my testimony about the prayer that led me to the Man [Jesus Christ] who changed my life. As I began to realize who I was and whose I was, I saw that God had known me even when I didn’t know Him. God had been with me all the time. I read in the Bible that God gives us the desires of our hearts. When I read that, I realized when I went into the Ritz Theater at 11 years old that God was there, too. He gave me the gift of seeing a glimpse of my future with the Globetrotters on that movie screen. It must have delighted God when He saw me get so excited and run out of that movie theater to make my own basket. God was there when I was frustrated that I had no place to play and God gave me the courage to keep on believing that a little black boy going from home to home, no place to call my own, would have a chance to be on a team known around the world – the Harlem Globetrotters. God was there all the time guiding me, comforting me and encouraging me. He was with me when I thought I was alone, practicing for hours while my buddies were off doing other things. God was there all the time waiting patiently for me to recognize His presence in my life and go running into His arms! What a wonderful place to be; in the arms of God who brings unspeakable joy. I knew, with all my heart, that Jesus Christ was the man who changed my life forever. When I was a kid, I used to sleep with a basketball. Now, whenever I get a hotel room while I’m traveling, the first thing I do is unpack my Bible and my study notes and put them on my bed. I study God’s Word in the same way I studied my basketball game. RM: Did you know at the time the impact you were having on others? ML: One of my greatest compliments is when people who I admire, and are superstars in their own right, refer to me as their hero or inspiration. Like when Shaquille O’Neal, saw me in the audience during a game and shouted over to me, “Meet me in the locker room after the game.” This was during a game, mind you. So I went down to the dressing room afterwards, and Shaq said to me, “When I was a little kid, you autographed a picture of yourself for me. I don’t know what became of it. It got lost somewhere along the line. Would you sign another one for me?” The picture and the memories still mean a lot to Shaq even though he’s a superstar himself. RM: You have brought so many others joy, what brings you joy? ML: Joy is the most powerful word in the Bible. I will be walking down the street and people will just start laughing and say, “I saw you when I was 6 years old.” I enjoy bringing others joy. I enjoy hearing their excitement when fans are telling me about watching me play and who they went to the game with now years later. I have always believed that helping others is the best way to help yourself. Nothing gives me more joy than helping someone – one person, or a whole crowd of people – have a better day, or a better view of their life. In those instances where I’ve led someone to God, or maybe I should say back to God, I’ve felt a deep sense of satisfaction and joy. RM: You’ve accomplished so much, what wisdom can you share when it comes to leading a full and meaningful life? ML: The final chapter is not yet written in my life. I don’t know the final score, although you’d better believe I am showing up to see what the score is! I think we should count the number of loving family members we have, and the number of caring friends. I think we should “keep score” by the number of wonderful experiences we’ve had. Experiences become a part of you. I’ll always remember all the wonderful places I’ve been fortunate enough to travel through and all the wonderful people who I have met along the way. I believe I’ll see with my own eyes the goodness of the Lord working in my children’s lives. I want my kids and their kids to have Godly, healthy, and long lives. I want them to respect themselves and others, and to be grateful for their blessings. I want you to always remember that I said life’s most meaningless statistic is the half time score, and as far as I’m concerned it’s always half time. You know, I bet nobody ever remembered the final score of a Globetrotters’ game. If 10,000 people came to a Globetrotter game, I bet not 10 of them could tell you the actual score of the game. It simply didn’t matter. It’s the joy that counts in life. Not the points, not the things, not the stuff. Be excited about the future. You’re going to spend the rest of your life there. The common denominator for all mankind is that we all get 24 hours in a day. What you do with that time is up to you. Choose well. Don’t worry about the final score. God is on His throne. The best is yet to come. And isn’t this the ultimate score? God 1: You 1 — A one-on-one relationship with our Creator for all eternity. I wish you all Joy, my friends.